Louis Vuitton (4 August 1821 – 27 February 1892) was a French businessman. He was the founder of theLouis Vuitton brand of leather goods now owned by LVMH. Prior to this, he had been appointed as trunk-maker to Empress Eugénie de Montijo, wife of Napoleon III. The Louis Vuitton label was founded by Vuitton in 1854 on Rue Neuve des Capucines in Paris, France. Louis Vuitton had observed that the HJ Cave Osilite trunk could be easily stacked and in 1858, Vuitton introduced his flat-bottom trunks with trianon canvas, making them lightweight and airtight. Before the introduction of Vuitton’s trunks, rounded-top trunks were used, generally to promote water run off, and thus could not be stacked. 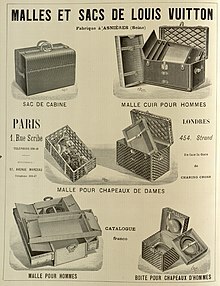 It was Vuitton’s gray Trianon canvas flat trunk that allowed the ability to stack with ease for voyages. Many other luggagemakers imitated LV’s style and design. After the death of his father, Georges Vuitton began a campaign to build the company into a worldwide corporation, exhibiting the company’s products at the Chicago World’s Fair in 1893. In 1896, the company launched the signature Monogram Canvas and made the worldwide patents on it. Its graphic symbols, including quatrefoils and flowers (as well as the LV monogram), were based on the trend of using Japanese and Oriental designs in the late Victorian era. The patents later proved to be successful in stopping counterfeiting. In this same year, Georges traveled to the United States, where he toured cities such as New York, Philadelphia, and Chicago, selling Vuitton products. In 1901, the Louis Vuitton Company introduced the Steamer Bag, a smaller piece of luggage designed to be kept inside Vuitton luggage trunks. By 1913, the Louis Vuitton Building opened on the Champs-Elysees. It was the largest travel-goods store in the world at the time. Stores also opened in New York, Bombay, Washington, London, Alexandria, and Buenos Aires as World War I began. Afterwards, in 1930, the Keepall bag was introduced. During 1932, LV introduced the Noé bag. This bag was originally made for champagne vintners to transport bottles. Soon thereafter, the Louis Vuitton Speedybag was introduced (both are still manufactured today). In 1936 Georges Vuitton died, and his son, Gaston-Louis Vuitton, assumed control of the company.